The Spinners fundraising program program was designed by individuals with over 50 years of combined fundraising experience. It can be re-used year after year. Your supporters will enjoy savings of over $150 in coupons from our national merchant affiliates for donating $1.00 – $ 4.00. Your school, sports team, church or non-profit group will raise on average of $185 in fundraising profits. 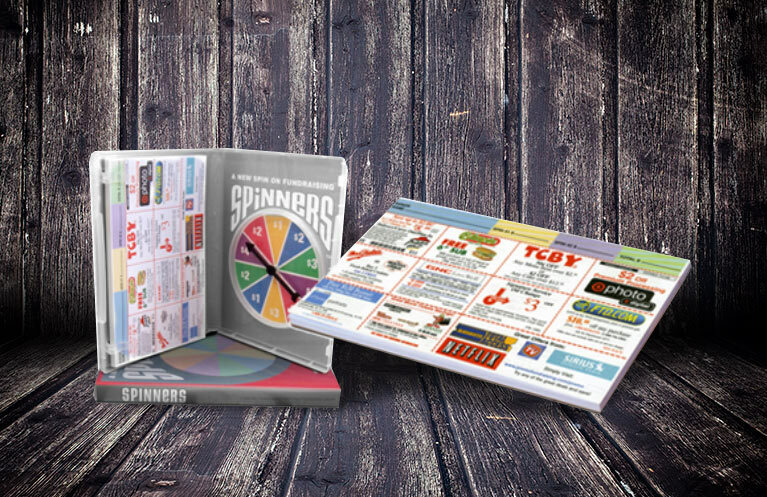 Make your next fundraiser, the most profitable fundraiser you have ever done with our Spinners Fundraising Idea. Are you a part of a sports team, youth group, band or any type of school group that has had to invest in uniforms, sports equipment or musical instruments in the past? You obviously are aware that these types of investments are quite significant, and one that you would not like to make every year. Fundraising should be no different. Why not invest in a fundraiser that can be used year after year, offering you the same kind of return? Spinners are the size of a standard DVD case and are made of a durable plastic that will last forever.